Endemic to Bermuda where historically it underwent a catastrophic decline of almost 95% due to scale insects, recent recovery is hampered by invasive plant species. Juniperus bermudiana occurs throughout Bermuda therefore the total area of the island is the equivalent of its extent of occurrence (EOO) 57km². In a ten year period between 1946 and 1956, almost 95% of the natural population was lost due to the effects of an introduced juniper scale (Carulaspis minima). Over the last 30 years a combination of residual resistance, reafforestation and, to a lesser extent, natural regeneration has led to an increase. The current population is estimated to be well over 10000 adult trees, possibly as high as 25000, which represents approximately 10% of its former population density in suitable habitat. Grows in shallow, calcareous soils on hillsides and along marshes and coastlines. Once formed almost pure stands with an estimated density of as much as 500 trees to the acre (Groves, 1955). Fruits ripen in September and October (Britton, 1918). Germination rates are good where the habitat allows, taking into account the vastly reduced adult population. The main seed disseminator seems to be the Starling, Sturnus vulgaris, which became naturalized in the 1950s, increased explosively in the 1960s, and is highly mobile. Natural self seeding occurs mainly in unmanaged coastal scrubland and exposed hilltops where the otherwise dominant invasive flora is sufficiently stunted or sparse due to wind and salt spray exposure to allow germination and juvenile growth of junipers to occur. In such areas a new forest cover is gradually developing where the juniper is the dominant emergent tree. It is estimated that the natural pre-disturbance generation length is 25 years and this is based on the length of time taken for a naturally regenerating stand of trees to reach harvestable age. Juniperus bermudiana underwent a catastrophic decline of almost 95% between 1946 and 1956. Over the last 30 years, the population has started to recover as a result of natural resistance in part of the remnant population and intensive conservation efforts. Invasive plant species still pose a significant threat. Juniperus bermudiana has an estimated generation length of 25 years so three generations is the equivalent of 75 years. Some of the causes of reduction are not reversible due to urbanisation and habitat loss. This species is therefore currently listed as Critically Endangered. Provided that the recovery is maintained, future re-assessments after the three generation period has expired should result in downlisting. From the time that Bermuda was first colonized in 1609 Juniperus bermudiana has been used extensively for construction purposes and as fuel for cooking. The use was so extensive that by 1622 special legislation had to be introduced (Tucker, 1970) to control the export of the island’s most dominant tree species. Between 1693 and 1878, the Bermuda legislature passed sixteen further acts in order to restrict the uses of the juniper. Despite these Acts, the ship-building industry eventually denuded much of Bermuda's landscape by the 1830s. The decline of the ship building industry after 1900, combined with the replacement of local juniper timber for construction with cheaper imported timber from the U.S. and rural electrification, which precluded the need for wood as cooking fuel, enabled a full recovery by the early 1940s. However, it was once more devastated as a result of the accidental introduction of two coccoid scale insects in 1946 (Challinor & Wingate, 1971). During the following decades the bare landscape was reafforested using exotic species. Casuarina equisetifolia was especially favoured for its rapid growth. Invasive broadleaf plant competitors (which create too deep a shade for seed germination or growth), are now by far the greatest factors limiting the junipers distribution and self-seeding potential. Likewise, germination of the naturalized Ficus retusa in rot hollows of old junipers (which leads to eventual overshading and strangulation) and overshading by taller growing invasive broadleaved trees, especially in sheltered valley situations, is now the major cause of adult mortality. To add to the problems, J. virginiana and J. virginaina var. silicicola have been introduced to Bermuda from Florida, USA. Both taxa are resistant to the scale insects. They readily hybridize with J. bermudiana causing a depletion of the germplasm through hybridization and introgression (Adams & Wingate, 2008) . Urbanisation is also a problem. Today Bermuda is recognised as one of the most densely populated isolated oceanic islands in the world with a mean human population density of five per acre and one third of the country is totally urban (Wingate, 2001). About 20% of Bermuda's land area is now paved over with roads, parking lots, buildings and industrial yards. This trend is likely to continue unabated. Juniperus bermudiana is cultivated in gardens outside of Bermuda and some of this material has potential to supplement restoration programmes in Bermuda. Perhaps the biggest planting is in St Helena and on Ascension Island where seed was introduced during the mid-19th century to establish timber tree plantations (Adams, 2008). Ironically on these islands J. bermudiana is now becoming an invasive problem. Juniperus virginiana has also been introduced on St. Helena so there is the potential for hybridization (Adams, 2008). Adams, R. and Wingate, D. (2008). Hybridization between Juniperus bermudiana and J. virginiana in Bermuda. Phytologia 90(2): 123-133. Adams, R.P. (2008). Juniperus bermudiana: a species in crisis, should it be rescued from introduced Junipers? Phytologia 90(2): 134-136. Bennett, F.D. and Hughes, I.W. (1959). Biological control of insect pests in Bermuda. Bulletin of Entomology Research 50: 423-436. Britton, N. (1918). Flora of Bermuda. Charles Scribner’s Sons, New York. Challinor, D. and Wingate, D. (1971). The struggle for the survivial of the Bermudan cedar. Biological Conservation 3(3): 220-222. Government of Bermuda. (2003). Protected Species Act 2003. Groves, G.R. (1955). The Bermuda cedar. Unasylva 9: 4. Groves, G.R. (1955). The Bermuda cedar. World Crops 7: 1-5. Phillips, B. (1984). Bermuda Cedar: Survival or extinction. Bermuda’s Heritage: 150-151. Procter, D. & Fleming, L.V. (eds.). (1999). Biodiversity: the UK Overseas Territories. Joint Nature Conservation Committee, Peterborough. Rueger, B. & von Wallmenich, T.N. (1996). 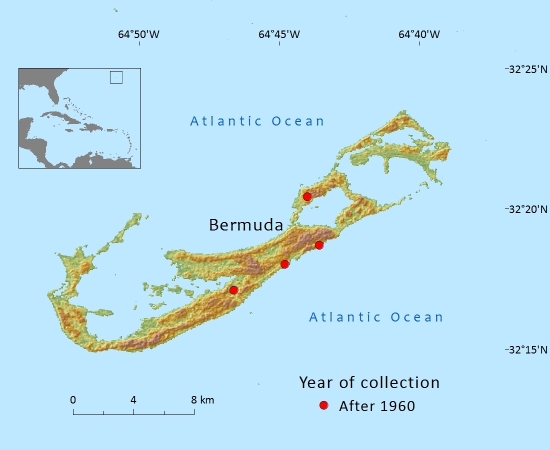 Human impact on the forests of Bermuda: the decline of endemic cedar and palmetto since 1609, recorded in the Holocene pollen record of Devonshire Marsh. Journal of Paleolimnology 16: 59-66. Tucker, T. (1970). Orders and constitutions to preserve the cedars and other trees. Bermuda Hist. Quart. 27: 23-25. Wingate, D. (2001). Strategies for successful biodiversity conservation and restoration on small oceanic islands: some examples from Bermuda. In: (ed. M. Pienkowski) (ed. ), Calpe (2000): Linking the Fragments of Paradise - An International Conference on Environmental Conservation in Small Territories, pp. 16-24. John Mackintosh Hall, Gibraltar. Wingate, D.( 2008). Point of view: Conservation of the Bermuda juniper. 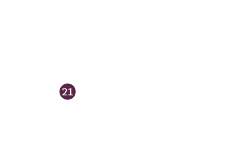 Phytologia 90(2): 137. Wingate, D.B. & Adams, R, Gardner, M. (2011). Juniperus bermudiana. In: IUCN 2012. IUCN Red List of Threatened Species. Version 2012.2. . Downloaded on 31 October 2012. D.B.Wingate,R.Adams,and M.F.Gardner, 2015. Juniperus bermudiana, from the website, Threatened Conifers of The World (http://threatenedconifers.rbge.org.uk/taxa/details/838).